A visualization of the Cosmic Microwave Background, or CMB: the oldest light in our universe, imprinted on the sky when the 13.8-billion-year-old universe was just 380,000 years old. The swirls in the image are polarization, or changes in the orientation of the light waves. The very first stars in the universe need to reset their birthday clocks: these ancient objects burst into existence more than 100 million years later than scientists previously thought, according to new research. 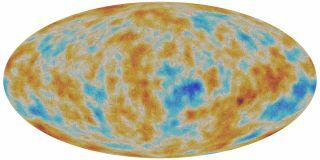 The most ancient light in the universe, known as the cosmic microwave background, seen by the European Space Agency's Planck satellite. The image also captures interstellar dust and the magnetic field of our galaxy. Planck used the CMB to estimate when stars began forming in the universe. A few hundred million years after the Big Bang, the light from some of the very first stars and galaxies lit up the universe and ended a period known as the "dark ages." New measurements by the European Space Agency's Planck satellite — which studied the cosmic microwave background, or the light left over from the Big Bang — indicate that this period of light began about 100 million years later than Planck's previous estimate. The new results are based on an additional year of observations recorded by the satellite. "While these 100 million years may seem negligible compared to the universe's age of almost 14 billion years, they make a significant difference when it comes to the formation of the first stars," Marco Bersanelli of the University of Milan and a member of the Planck Collaboration, said in a statement. This haze of gas that filled the universe blocked most wavelengths of light, which is why this time is referred to as "dark." The powerful photons created by stars and galaxies ripped the atoms apart, or ionized them, which is why this era is known as reionization. Galaxies called quasars burst into existence around this time; at the center of a quasar is a supermassive black hole that ejects powerful jets of light and matter into the universe. Observations by NASA's Hubble Space Telescope show that the universe was entirely clear of this fog by about 900 million years after the Big Bang, the ESA statement said. But when did it begin? Previous observations by Planck cited the start of reionization as being about 450 million years after the Big Bang. The new results used a larger data set, taken between 2009 and 2013, and pushed that measurement forward by 100 million years. Because stars and galaxies drove the start of reionization, scientists with the Planck collaboration say the new measurement also indicates about when those stars and galaxies started forming. "These things are basically two sides of the same coin," François Bouchet, of the Paris Institute of Astrophysics and a member of the Planck Collaboration, told Space.com. Bouchet said that Planck can identify the average starting time of star and galaxy formation, but not when specific stars were born. Rare stars have been identified that may have formed before the end of the dark ages. For now, scientists with Planck think of reionization as an "instantaneous" event — "instantaneous" on a cosmological time scale, that is — but of course, Bouchet explained, it must actually be an event that took place over a period of time. The Planck telescope can study reionization by looking at the cosmic microwave background: a static haze of light that fills the entire universe. This light was created by the Big Bang, and has radiated through the universe ever since. In that time, it has picked up information about the events that have taken place in the cosmic history. When the universe began to emerge from the dark ages, hydrogen atoms were ripped apart into protons and electrons. The electrons interacted with the CMB and left an imprint in the light's "polarization" — or the orientation of the light waves, according to the ESA statement. Planck scientists have picked up on that subtle change. The new results are part of a major release of new analyses from the Planck Collaboration. Planck made headlines last week when it released a long-awaited, joint analysis with the BICEP2 collaboration. The new work showed that results presented by BICEP2 scientists in March of last year, which claimed to show evidence of gravitational waves and inflation in the early universe, were contaminated by space dust. Planck is still collecting data on the CBM, and Bouchet said he feels confident that the Planck satellite will be able to provide a more detailed timeline of the universe as it emerged from the dark ages.